Like millions of others, you may be the victim of cell phone abuse. What is cell phone abuse? Your concentration breaks or your conversation ends or your peaceful moment disturbs’ Now you are a victim of cell phone abuse. • Cell phone use in social situations may result in overload – both physical and mental. • Local interaction with the surroundings and remote interaction with the other person demands certain attention- E.g. When you talk in a bus stand or crossing the road. • Cell phone use in public places makes the user “blind “to local cues due to cognitive overload. E.g. When you use cell phone while walking through the road, you will not see a vehicle coming close to you. • Cell phone use in public places reduces the reaction time to events around the user. E.g. You will not get time to move away from a danger. • Reduced attention to local situation may disturb others since the user is not attending the social situation. E.g. Your conversation and body language may be annoying to others. 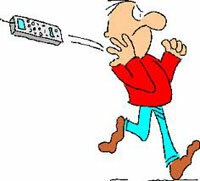 • The alarming ring tone may demand higher attention to the phone rather than the local settings. If you use cell phones in busy areas, trains or buses, the sudden ring tone may alter your attention or the message from the caller may cause a disturbed feeling. This will leads to inattention blindness. This will not be the condition, if you use a land phone. • Caller Hegemony is the asymmetric relationship between the caller and answerer. Mobile phone use in public places makes the user overloaded and become unaware of the details of communicative behavior of co- located individuals as well as other relevant features of the social situation. It is advised that not use cell phones while driving a vehicle or operating machinery or crossing the road. • Cognitive load rises above visual sensation and diverts attention. • Reaction to and memory of visual inputs while driving will drastically reduce if the cognitive load increases. • The same negative effects may also happen if the driver uses a hands free phone. E.g. If the actual distance between two vehicles is 5 meters, due to cognitive load, the driver may feel that, it is 10 meters. This is the reason for the accidents, if cell phone is used while driving a vehicle. To the cell phone abusers we say ………….. Consider cell phone as a communication device and not as a status symbol. Try a little Cell phone courtesy…. and do not burden others with the pseudo social behavior. Previous Mobile Phone – How it Works?